UPPER EAST SIDE — The American Folk Art Museum has crowned 2011 the "Year of the Quilt," and as part of its focus on these homespun textiles, the organization is staging New York City's largest-ever quilt exhibition under one roof. 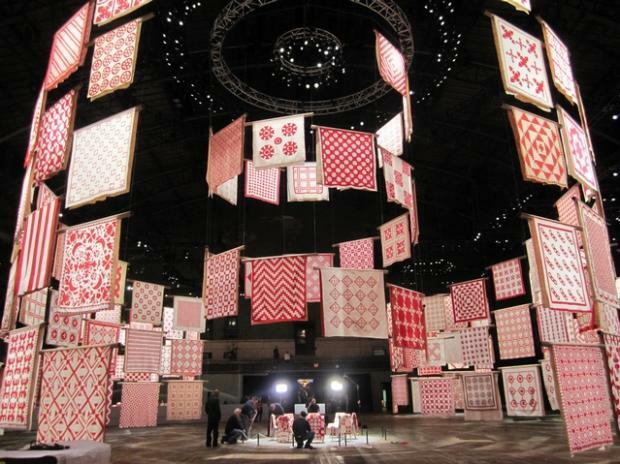 An astounding 651 red and white quilts were being hung on Thursday inside the 55,000-square-foot Wade Thompson Drill Hall of the Park Avenue Armory. The show, "Infinite Variety: Three Centuries of Red and White Quilts," will be open — and free to the public — from Friday through Wednesday. The quilts, which come from the private collection of Joanna Rose, wife of real estate mogul Daniel Rose, are suspended in dramatic Alice-in-Wonderland-like spirals from the armory's vast ceiling, organized around a central image: a circle of chairs. "It begins with the chairs in the middle," said Tom Hennes, of the exhibition design firm Thinc. "One of our staff kept thinking of quilting circles, quilting bees. These objects are done in communities, mostly women, and we wanted to honor that." The spirals, he explained, pay homage to the "prolific creativity and output of mostly anonymous people." No two quilts are alike. There are patterns of stars and zigzags, images of churches and boats. Some date back to the turn of the century, but most are mid- to late-19th century for a simple reason, explained Folk Art Museum Senior Curator Stacy Hollander: synthetic red dye became available in 1868. "Red has always been a coveted color but before the synthetic dye it was so precious. Red was reserved for special use before it became more widely available to the public at large," Hollander said. In her 30 years staging quilt exhibitions, Hollander has never seen anything close to the sheer size of this installation. As a point of comparison, the show currently on view at the museum, "Quilts: Masterworks from the American Folk Art Museum," has 30 quilts and spans three floors, she said. Hennes' team had toyed with various concepts for the space, including suspending hundreds of beds from the ceiling, which they ultimately decided was "too contrived." "It's an astonishing collection and the space really allows it to float on its own," Hennes said. "We wanted the quilts to be the architecture of the space." Park Avenue Armory 643 Park Avenue (between 66th and 67th streets). Free and Open to the Public. Exhibition Hours: March 25, 11 a.m. - 7 p.m.; March 26, 11 a.m. - 7 p.m.; March 27, 11 a.m. - 5 p.m.; March 28, 11 a.m. - 7 p.m.; March 29, 11 a.m. - 7 p.m.; and March 30, 11 a.m. - 5 p.m.